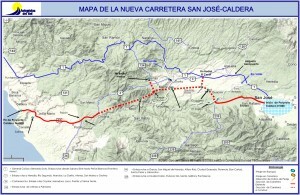 Before the completion of this highway, the alternative was to take the Pan American Highway (aka Route 1, or the InterAmericana, etc) northwest to the Atenas/Jaco cutoff in La Garita, then deal with horrendous traffic to the beach… or, you could continue a bit further on Route 1 and get off around Puntarenas. Either way, you were in for a nasty time having to follow trucks moving at 8 mph through winding, but admittedly beautiful, mountain roads. You were looking at a minimum of 2 hours, or more likely longer, to get to Jaco or Puntarenas. Two hours of breathing exhaust, and that was if you were leaving from the San Jose airport. From downtown San Jose you’d need to add an (optimistic) thirty minutes more. You can see how this will make things a lot better for anyone wanting to get to the the beach quickly and comfortably. The drive is pretty spectacular too. The new bridge over the Rio Grande is quite beautiful and the mountain views are worth the trip. This trip is not cheap, and by Costa Rica toll standards, it is a fortune. There are three toll booths (peajes) en route, The first and third are 490 colones each and the second is 640 colones. This is a bit under $3.00, cheap by most US standards, but huge by Costa Rica standards. Still, with gas prices at ridiculous levels and the time saving, I am guessing this is not going to deter anyone. I picked yesterday as I thought that many Ticos might choose to hang around their homes in preparation for today’s presidential elections. Lucky guess! The road is in beautiful shape as you might expect from something two weeks old. It is generally two lanes wide (one in each direction) though it widens to an additional lane going uphill (for use in passing slow traffic). Now saying that, Costa Rica drivers may be the worst drivers in the world. Patience is a word few Ticos (and some really dumb tourists) understand when behind the wheel of a car. Illegal passing on all highways (autopistas) is a primary cause of many incredibly violent and needless accidents every week. This illegal passing thing places everyone in real danger, and while the trip down was a piece o’ cake, the drive back, took nearly two hours because of a really bad head-on collision (see photo above right), doubtless caused by illegal passing. Why only two lanes? Now there is a question. I love Costa Rica, but honestly, the concept of planning seems to evade the Costa Rican government(s). One might argue that planning for this highway began long before there were so many cars and so many tourists, but to me, that dog won’t hunt. Traffic to and from Caldera certainly could have been predicted ten to fifteen years ago allowing for widening of this toll road. 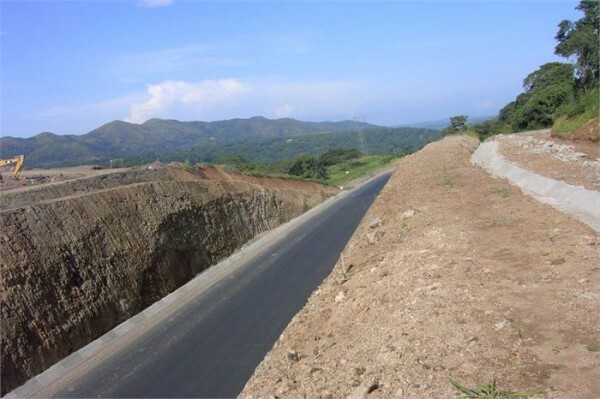 Granted, widening roads here in Costa Rica that wind through mountains and cross many rivers would clearly be a major expense… still, if they were not planning to enforce the driving laws, then the real cost of reckless driving will must include numerous lost lives. 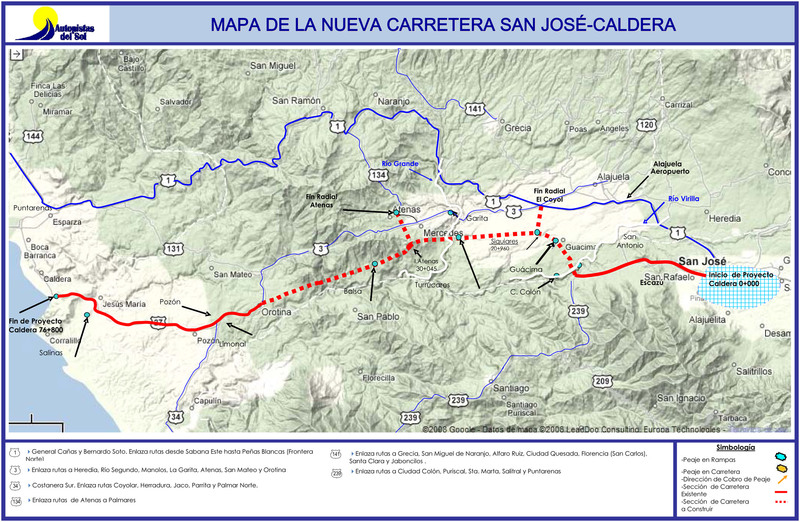 Another example: To reach the toll road to Caldera from say the San Jose airport, the most direct route (but maybe not the fastest) would be to access the toll road using the Lindora highway that runs between Panasonic and Santa Ana. The problem here is that there are at least 6-8 new high rise office buildings, several dozen new stores, strip malls and supermarkets, every fast food outlet known to man, a zillion new restaurants and several hundred new condos and houses lining Lindora which remains not 6 inches wider than it was ten years ago when it was almost all farm land. That means that the (perhaps) 1.5 mile drive from Panasonic to the toll road can easily take 40 minutes. Yesterday, it took 15 minutes and the traffic was not all that bad. Still, they are continuing to all new construction almost daily. Oh well! Anyway… we had a fine time walking along the beach in Puntarenas and stopping at the many dozens of kiosks selling jewelry, souvenirs, and clothing. It was warm (high 80’s) but there was a fine breeze making it all tolerable. I also got nice brownie points for buying my wife new earrings and a pair of shorts. Life is good! Its about time they got that Highway finished I just couldnt stand much more of those Mountain roads between San Jose and the coast..Heavy traffic or no heavy traffic the landscape in this part of Costa Rica will never be the same again, What a welcome change and much needed. Thank you for this information. I’m looking forward to driving on this new road. Maybe next week. Looks good from hear. I guess that the two lane construction falls in the category of something is better than nothing. 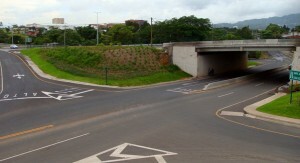 If the land acquisition necessary to build four lanes had taken place, the opening of the roadway might have been postponed for another 30 years. Imminent domain…I don’t think that it exists here. Maybe it will become the first toll road in the world with speed bumps intended to slow down the traffic. Has anyone heard when the road between Panasonic and Prospero Fernandez might be improved? I hope that doesn’t take 30 years! I was visiting Costa Rica last week and saw on the news that there were a lot of people protesting the opening of this new highway. I couldn’t understand the newscaster so I’m not sure why they were protesting. Any know the answer to that? I enjoyed the new hwy. The single lanes is thing stupid with the odd passing lane. anyhow if you avoid it Sat. Sundays should be fine. Truckers will not use it due to the high cost so this will make it faster. I made it in 55 minutes with a 1965 fj 40 landcruiser to the the Hilton Fiesta In Puntarenas. Avarage speed of 75 klms per hour. I still believe anyone looking for a nice drive should take Puriscal to Orotina. As is about an hour to the coast was a delight. I took my 3 year old son and he was thrilled to paly in the the ocean for the morning and I was back for work before lunch was over. I drove down Monday to my home in Dominical and it was a pleasure not to have to trail the trucks through the Atenas mountains. I got on in Escazu by the CIMA hospital and it was 3 hours at 80 kmh to Domi. Used to be 4-5 hours. I returned Wed afternoon. All in all it is a major improvement BUT 2 things I was not pleased with. WTF were they thinking when they decide the tolls would be 480, 490, 600, 360 colones? How stupid is that? Why not just make them all 500? Do I need the 2cents in change? When it got dark, I couldn’t find the necessary change so I just had to keep throwing Rojos at them. And 2,there is no way a tourist can possibly find the airport coming from the west. That is the biggest mistake they made. I had specific directions from the Santa Ana exit but I would tell friends to continue on to Escazu and go back to Alejuela on the old expressway. — Sure they will! The savings in gas plus time saved will have them all over that road! — Shhhhhhhh!!! That road is never to be discussed on any of my web sites! Now you have screwed it up for me! There´s a couple reasons the road is only 2 lanes in some parts. First there´s bureaucracy. It took 30 years to design, build and start to operate the highway using the old designs. If they had opted for more lanes it probably would have taken another 5 or 10 years. Better to lay down the road now and widen later, in any case the existence of the highway automatically halts construction permits on the edges so the terrain to widen is safe for now. Second there´s investment considerations. Since the road is privately operated, the operator is going to try to fit as many people into as little asphalt as he can. There´s a minimum required service level, of course, but above that it´s give as little and collect as much as you can. The operator really gets nothing out of building 2 lanes the whole way if one of those lanes is going to be empty 60-70% of the time. However I hear that required service levels could provide for widening in some segments. If it´s determined that the operator´s studies were faulty and service levels are inadequate, it´s possible to force them to build an additional lane. But for that to happen, you have to give the people time to adjust to the highway. First and second weekends were a disaster because everyone decided to try out the new road, much like everyone wanting to get into the new mall the first day. We´ll have to see how it goes as the year progresses and the novelty dies down. From what you describe, service levels should be all right once the adjustment phase is complete. On the same day on that road another car was heading right at us fish-tailing. Thank God he missed us. He took a turn much too fast and couldn’t control it. We stopped off at Nicoya to get swimsuits for our kids and get a bite to eat. Two cars had piled into each other on the corner sidewalk in downtown. The day before a truck just pushed right into a car in front of us in San José that was stopped for a light, crunching its fender. I was stunned at the utter stupidity of the truck driver. Drivers routinely roll right into the crossing lane rather than stopping at corner stop signs, shocking those unaccostomed to this aggression. As you know it is totally irresponsible that they have so few road signs in Costa Rica. We went around in circles it seems forever trying to find connections just a few miles or even blocks away to major highways. Talk about wasting gas and time. Stories of driving problems I’m sure can go on forever. This was just in the eight days we were there. My wife, the PhD navigator, was petrified through most of the San José driving. I headed up a one way street and none of the cars offered me a break as I was trying to turn around. They love to honk their horns. We’re from Oregon and we hardly ever use our horns. We slow down and help people pass. What a concept! And we’re planning to move to Costa Rica this summer and enroll our kids at the English language Lincoln School. Excellent school. One question I’m working on: I’ll be filing as a “pensionado” which allows my wife and kids to come with me, of course. But what is the paperwork required for them? Great blog. Thanks a lot. Would I now take this road from the Airport (SJO) to quepos/manuel antonio. Sure, but it does not start anywhere near the airport, so you have to get there via back roads… maybe 10-12 minutes if you know the way. As for back roads do you mean going back towards San Jose VIA 1 to 239 to 27? BTW this thread was pretty helpful on directions from the airport to the new road. I think i’ll try out the 20 minute route as the 1st set of directions are strangely worded to me. Multiple directions at the bottom in the comments section.